Lab suppliers interested in meeting researchers and selling lab equipment in San Francisco will want to take note of Biotechnology Calendar, Inc.’s life science events at the University of California, San Francisco. Biotechnology Calendar, Inc. has been organizing life science events for twenty years. We give lab suppliers the opportunity to meet researchers who are receptive to learning about the latest lab products on the market and who have the budgets available to purchase lab equipment that saves them time and money. Our San Francisco, Mission Bay Biotechnology Vendor Showcase™ Event will take place on February 6th, 2014. The University of California, San Francisco receives a wealth of research funding from the NIH and NSF every year. In 2013, the NIH awarded the University of California, San Francisco $501.2 million in life science funding. These awards were given out to various departments at the university. For the convenience of our readers, we have put together a list of the top-funded life science departments at the University of California, San Francisco organized by department name, number of awards received and total funding awarded. A full list of departments receiving funding can be found on the NIH website. Not only did the University of California San Francisco receive life science funding from the NIH, but the NSF awarded the university $6 million in 2012. The top NSF-funded life science project at the University of California, San Francisco was funded by the neural systems cluster funding program and was titled “Small RNAs as Hormones.” The project received $250,000. For more detailed NSF funding information, please visit the NSF website. Biotechnology Calendar, Inc.’s life science events at the University of California, San Francisco attract hundreds of receptive attendee-researchers. 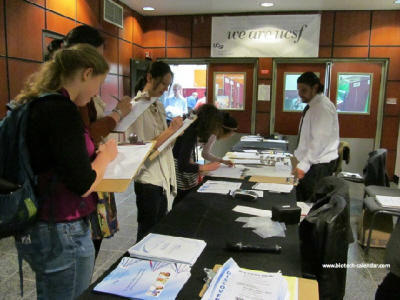 In 2012, the San Francisco, Mission Bay Biotechnology Vendor Showcase™ Event attracted 280 attendees. Of these attendees, 98 were purchasing agents, professors and post docs, and 41 were lab managers. The event visitors came from 21 different research buildings and 45 departments around campus. Meeting researchers and selling lab equipment at the University of California, San Francisco has never been easier. Researchers love our events because registration is easy and they know everyone from their lab is invited. Our delicious catered lunches provide a social tool for researchers, post docs and lab managers to talk with each other and discuss their problems in the lab with sales reps. Our event staff are available throughout each life science event to answer the questions of researchers and sales reps alike. From finding a seminar space to locating a vendor with a specific product, attendees and exhibitors can count on our professionals to send them in the right direction. Biotechnology Calendar, Inc. is a full service science research marketing and events-planning company that organizes life science events at top research institutions across the country. If you would like to meet researchers and sell lab equipment at a trade show closer to home, we encourage you to view our 2014 calendar of events. For more funding statistics on the University of California, San Francisco or information on our San Francisco, Mission Bay Biotechnology Vendor Showcase™ Event, click on the button below.